Through a written reply answer to the question in Lok Sabha the Minister of State (Health and Family Welfare), Smt Anupriya Patel informed about the Mission Indradhanush. The ministry informed about the mission Indradhanush aims to increase full immunization coverage in India to at least 90% children by December 2018. The salient feature of Mission Indradhanush is to cover unvaccinated and partially vaccinated children in areas with low immunization coverage, in both urban and rural areas. The State/UT-wise details of children and women vaccinated including Uttar Pradesh under Mission Indradhanush is given at Annexure-1. No separate funds are allocated for Mission Indradhanush. Funds allocated for Routine Immunization under part ‘C’ of Programme Implementation Plan (PIP) are being utilized by the states to carry out activities under Mission Indradhanush. The minister further added that Mission Indradhanush does not target to reduce postnatal death rate but targets to reduce diseases and death due to vaccine-preventable diseases. The State/UT-wise number of children and women vaccinated during the year 2017-18 is given at Annexure-2. 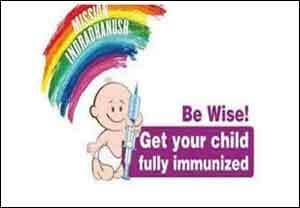 Routine Immunization which is implemented across the country has been further strengthened through Mission Indradhanush. Mission Indradhanush has been implemented in low coverage pockets and has been expanded during (i) Intensified Mission Indradhanush (ii) Gram Swaraj Abhiyan and (iii) Expanded Gram Swaraj Abhiyaan.